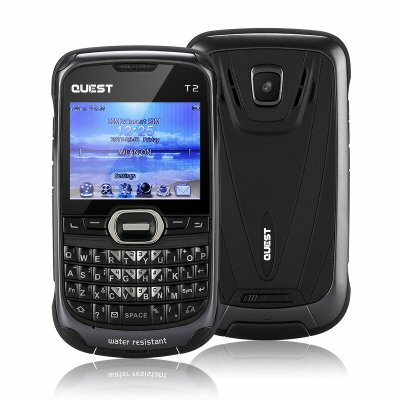 Successfully Added Quest T2 Cell Phone - Bluetooth, GSM, WiFi, Dual-IMEI, 32GB SD Card Slot, 1020mAh Battery, Physical Keyboard to your Shopping Cart. If you are looking for an affordable backup phone, the Quest T2 certainly is a device to consider. This classic mobile phone comes with an advanced key-pad that lets you easily write up messages and browse the web. This feature is especially useful for those of you that often find themselves in situations where you need to reply to long messages. Your phone furthermore comes with a 2.3-Inch display that delivers clear and crisp visuals. It has a durable design making it resistant to minor drops and impacts. This makes it the perfect backup phone to have at your side at all times. With Dual-SIM card slots and two IMEI numbers, this mobile phone lets you be reachable on two phone numbers at the same time. This comes in especially handy for when traveling abroad or for those of you that wish to separate work and private life. With this cheap cell phone at your side, you’ll always stay within reach to friends, family, and colleagues. It even supports WiFi, meaning you’ll be able to browse the web on your cell phone when you’re at home or in the office. A powerful 1020mAh battery treats you to 12 hours continuous usage time. Additionally, it delivers an absolutely stunning 200 hours standby time. Therefore, you’ll be able to keep this phone in your bag without using it for several days and you’ll never have to worry about its battery life. With its 32GB SD card slot, you’ll be treated to more than enough storage for your contact information, files, and pictures. The latter of which can be snapped with the phone’s 2MP rear camera. The Quest T2 cell phone comes with a 12 months warranty, brought to you by the leader in electronic devices as well as wholesale mobile phones..